Runic Games is advertising its upcoming dungeon crawler with a 28-song soundtrack. I'm a bit of a sucker for game soundtracks. Overall, they're a great way to continue my enjoyment of a game well after I've put down the controller, taking me right back to the stories and moments I enjoyed as I played. In recent years, digital distribution has made it much easier for fans to track down the music from their favorite games, since developers can easily put the tracks online or bundle them into digitial Game of the Year Editions. Runic Games has recently decided to try out the former option by releasing the complete Torchlight II soundtrack a mere two days before release, allowing anyone with an internet collection to download all 28 songs for the unbeatable price of free. 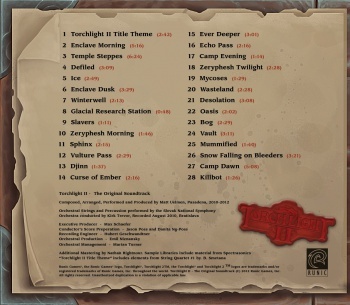 The soundtrack, created specifically for Torchlight II by Matt Uelmen, has been specifically remastered for listening purposes and released at CD quality. The download even includes a high-resolution CD Booklet PDF, for users who want to create a physical copy they can proudly display within a collection. The Torchlight II page hosting the soundtrack has had a couple of hiccups since it went live, but everything seems to be running smoothly for the moment. At the very least, it will put you in the mood for the actual game when it finally launches this Thursday, September 20th.